Hey Folks, Freecharge is back with their all time blockbuster coupon code of 50 Rs cashback. 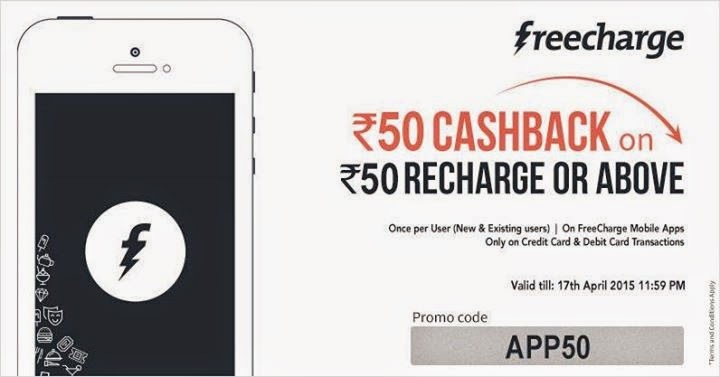 Just open the freecharge app in your android phone and do a 50 rs recharge, before proceeding to the payment, just apply the below mentioned coupon code and you will avail 50 Rs cashback in your freecharge credits, use that credits for another 50 rs recharge and that's how you will get 100 rs recharge in just 50 rs. No hi-tech tricks required just use this coupon code and enjoy. Note : This Coupon code is valid one time per user or one credit/debit card per user and valid till 17 april 2015. No matter, which mobile network you are using, whether it's docomo, airtel, videocon or reliance, this Cashback coupon will work for all the prepaid recharge transactions. Don't forget to subscribe latest coupon and deals updates by your email, check out below email subscription section.